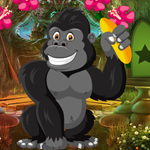 Games4King - G4K Gorilla Rescue is another point and click escape game developed by Games 4 King. There was a huge fortress in a dark surrounding area. The fort is very intimidating to see. There is a gorilla living in that place. That gorilla was unexpectedly stuck in the fort that day. Your duty is to save the gorilla from there. From there it will help you to find the hidden clues to save that gorilla. All guides are found and those gorilla rescued from the castle and congratulate you to win the game. The tricks of the trick are a little harder to find, but somehow it may be a matter of interest. This game is highly desirable. Good luck and have a fun! Do you ever wonder why EG24 added the Rot13 converter? Do you ever wonder why AlphaOmega hides the important hints between other characters? Do you ever wonder why nobody else posts every single step they do? Hey burgers, I can't use the rot13 converter and Dazz helps me a lot with her posts. we are not all as smart as you i guess. I like Alpha's hints too. I am stuck in the early stages. Can't find any hints of items to use to get going again. did you move squirrel or bird already? Thanks Alpha, I gave up waiting and checked the walkthrough to get moving. I love the help I get from all of you, hate Rot, is stupid, and Dazz and Alpha love so much your hints, so BBB if you calling for attention you got your 10 seconds of fame, lay off, this a page to help each other, not to complain. I have stopped, I do not get the colors right and with osteoarthritis every box has to be clicked and every heart has to resist a lot of pain. Too bad, why do not the colors make a clearer distinction? 1 star.